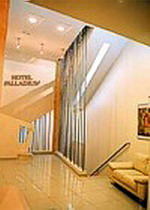 The Palladium Hotel is not for the solitude seekers. With one of the most popular Night Clubs on the lower floor, the modern style hotel offers extravagant rooms with equally extravagant names: romantic rose fragrant suite "Cleopatra", all regular and leather super suite "Caesar", or democratic standard "Capri". All rooms at the Palladium have climate-control, electronic safety system, cable TV, mini-bar and phone.